An increasing emphasis on electronic health records, combined with the aging population in the U.S., demands the rapid expansion of healthcare occupations. In fact, the Bureau of Labor Statistics projects the number of medical and health services managers to grow 20% by 2026, nearly three times the expected average growth of all occupations. Moreover, the Georgetown University Center of Education and the Workforce expects the country to create nearly seven million healthcare services jobs by 2020. Now is an exciting time to earn your online bachelor of health services, knowing you can make a meaningful difference in others' lives while fulfilling your career goals. Studies for your bachelor of health services degree require interdisciplinary coursework. In addition to classes like healthcare facilities management, healthcare policies, and healthcare financial management, coursework examines topics like strategic planning, information technology, and ethics. In addition, your general education classes require arts and humanities, communications, and social sciences. Furthermore, you might opt to specialize in a specific type of healthcare service, such as emergency management, long-term care, and health information systems. This allows you to customize your degree to your interests. Ultimately, your experience throughout an online bachelor of health services program depends largely on where you choose to earn it. The school and program you select will determine graduation requirements and learning opportunities available to each student. Some programs may require group work to role play and problem-solve health services challenges while others require internships to practically apply classroom lessons in real-world setting. In general, you must earn 120 credits to complete your bachelor of health services degree. This includes classes specific to the major and those necessary to a liberal arts curriculum. University of Central Florida ranks #1 on The 25 Best Online Bachelor's in Health Services Programs! The University of Central Florida in Orlando may be the largest campus in America when classified by undergraduate enrollment, but that does not mean students lack an individualized academic experience. The institution's bachelor's in health services administration online offers small class sizes, ensuring every degree seeker has the support and access to faculty/administrators needed to thrive. UCF maintains a separate, 50-acre campus devoted to health services education and is regularly praised for its innovation in research and graduate achievements. Created as a professional degree emphasizing the managerial aspects of the healthcare arena, distance learners are immersed in studies preparing them for entry-level roles upon graduation. Some of the unique courses available among the 120 credits include healthcare finance, principles of managed care, and healthcare needs of the elderly. This degree can be completed entirely off-campus, making it possible for recent high school graduates or working professionals to complete their degree flexibly. Aside from required coursework, all students must complete a semester-long internship at an approved site near their residence. The department maintains an active presence on social media and regularly posts blogs and other ways for online students to get involved. UCF's program is certified by the Association of University Programs in Health Administration. Because approximately 51% of UCF's undergraduate learners are from outside the state, new students can rest assured knowing they'll have a national alumni network to help with future jobs. The University of Central Florida is regionally accredited by the Southern Association of Colleges and Schools. Florida International University ranks #2 on The 25 Best Online Bachelor's in Health Services Programs! Miami's Florida International University offers an online bachelor of health service administration that prepares graduates for entry-level managerial roles in many healthcare settings upon graduation. As part of a very popular undergraduate health services administration degrees program, students know they're attending a school prioritizing learning and career opportunities. Areas of emphasis for this degree include financial management, systems engineering, policies and regulations, research, economics, program planning and evaluation, and the legal ramifications of running large healthcare systems. The program requires 120 credits in total, but distance learners can transfer in existing credits if they've already completed an associate degree in a similar topic or have related classes on their transcript. FIU's program allows degree seekers to begin their educations in the fall, spring, or summer and makes classes available asynchronously, ensuring learners do not have to choose between working or going to school. Despite great autonomy, the school also heavily emphasizes help for all learners. Students can access 24/7 support, quick faculty feedback, and a personal success coach who provides individualized encouragement. Faculty are also regularly praised at FIU for having a nuanced understanding of the academics while possessing substantial real-world experience. Those interested in learning more can attend online info sessions to learn more about their future at FIU. FIU is regionally accredited by the Southern Association of Colleges and Schools. Keiser University - Ft Lauderdale ranks #3 on The 25 Best Online Bachelor's in Health Services Programs! Formed as a Florida-based career college in 1977, Keiser University continues its mission by providing campus-based and online degrees to students looking for educational programs that propel them directly into careers. The university's bachelor's in health services administration online has no prerequisites for major courses, making it easy for students of many backgrounds to get started immediately. Classes are divided between theoretical frameworks and practical skills, ensuring students have the knowledge and tools necessary to thrive in any setting. Coursework also delves into public and private sectors of healthcare to ensure students know the differences and can make an educated decision about where they will work upon graduation. The 120 required credits are divided into lower and upper division major courses as well as four upper division general education courses. Some classes students can expect to take include management laws and employee relations, long-term managed care systems, and issues in healthcare communication. All students must complete a health services administration capstone project to demonstrate their learning throughout obtaining the degree. Because many of the students attending Keiser are working adult learners, all courses are available asynchronously so they do not have to choose between going to work, taking care of their families, or completing a postsecondary degree. Though campus visits are not required, the school maintains locations throughout Florida if learners want to complete some classes on campus. Keiser University is regionally accredited by the Southern Association of Colleges and Schools. Old Dominion University ranks #4 on The 25 Best Online Bachelor's in Health Services Programs! Unlike other online bachelor of health services administration programs, Old Dominion University's offering is a degree completion program designed for distance learners who have an associate degree or significant credits who want to earn a four-year diploma. Offered as a health sciences bachelor's with a concentration in health services administration, this program is specifically designed for current administrative healthcare professionals wishing to build on existing skills and knowledge and move into a middle- or upper-level position. Graduates have gone onto positions at hospitals, clinics, wellness centers, gyms, retirement centers, home health organizations, public health agencies, and community-based health clinics. ODU's degree is one of fewer than 50 undergraduate programs in America approved by the Association of University Programs in Health Administration. It requires students to complete approximately 60 credits – depending on their prior accomplishments in higher education. In addition to traditional classes like managerial epidemiology, environmental health science, and health aspects of aging, ODU's degree also incorporates innovative classes in policy and politics of health, critical issues, and contemporary organizations and management. In addition to degree-specific coursework, distance learners also complete 300-400-level management classes and a semester-long internship. Online students need to submit proof that they've completed STAT 130M and CHP 200 before admission. They'll also need to supply three letters of recommendation, a statement of purpose, and transcripts demonstrating a GPA of 3.0 or higher. Old Dominion University is regionally accredited by the Southern Association of Colleges and Schools Commision on Colleges. Drexel University ranks #5 on The 25 Best Online Bachelor's in Health Services Programs! From its location in Philadelphia, Drexel University is educating hundreds of future health services administrators throughout the country through its innovative online bachelor's in health services administration. Unlike other programs dividing classes into traditional semester credits, Drexel's program requires 180 to 184 quarter credits -- but can still be completed in the traditional four years. Transfer students are allowed to bring up to 135 quarter credits if they come from an accredited institution, came with at least a “C” grade, and the courses fulfill either general education or major-specific requirements. Classes are divided into 10-week terms, and students complete four terms per year. In addition to traditional general education requirements, students complete nine credits related to health services administration and an additional four classes from the school of business to round out their knowledge of statistics, economics, accounting, and organizational behavior. To apply for Drexel's program, students need to provide official high school and/or college transcripts, ACT/SAT scores, letters of recommendation, and a personal statement detailing how their education at Drexel will prepare them for the world of health services administration. Unlike other schools that sometimes use faculty members who do not teach in brick-and-mortar classrooms to oversee online courses, Drexel puts students at ease knowing that all classes are taught by the same campus-based faculty leading traditional courses. Additionally, individuals already working at one of the institution's health system partners or community colleges can receive a special tuition discount. Clarkson College ranks #6 on The 25 Best Online Bachelor's in Health Services Programs! Clarkson College's home base of Omaha may not densely populated, but thanks to the university's online bachelor in health services administration, students can be located anywhere in America and still take advantage of their rigorous and innovative plan of study. The bachelor of science in healthcare services at Clarkson was designed to be a truly interdisciplinary degree that is easily translated to many areas of the industry. In addition to the standard curriculum, students can also complete a concentration in gerontology, healthcare business, human services, public health, or women's health to further specialize their knowledge and make them even more qualified for more nuanced roles. Clarkson's degree requires 132 credits and includes a 135-hour practicum at a local, approved healthcare site where students can gain hands-on experience before graduation. Students with an associate degree can usually finish this program in three to four semesters, while first-time learners usually need 12 semesters to move from matriculation to graduation. Unlike some programs that only allow distance learners to begin during the fall semester, Clarkson makes it possible for newly admitted students to begin in August, January, or May. Clarkson alumni have gone onto positions in hospitals, health departments, and research facilities to schools, public health organizations, and insurance companies. Clarkson College is regionally accredited by the Higher Learning Commission. University of Maryland-University College ranks #7 on The 25 Best Online Bachelor's in Health Services Programs! With a global student body of over 90,000 students, the University of Maryland's University College is considered one of the biggest online colleges in the world. With an application process that ensures a 100% acceptance rate to all undergraduate programs, students nervous about their previous grades can get into a top online bachelor's in health services administration. The program requires 120 credits, but transfer students can bring in up to 90 hours if they have previous academic credits on their transcript. In addition to covering theoretical concepts helping develop and guide graduates' philosophy of health services administration, the plan of study is also full of practical, hands-on learning opportunities that build important skills. Examples of meaningful projects include conducting a quantitative analysis project, participating in a group project aimed to mimic a healthcare management team, analyzing failures of other healthcare companies through case studies and making recommendations, and writing a long-form research paper about a specific issue facing healthcare administration. All of UMUC's health services administration courses are available online, meaning students never need to visit the Adelphi campus to graduate. The department offers scholarships to help offset costs, as well as providing discounted tuition for active or veteran members of the military. While online students may initially feel they are lacking the benefits of studying on campus, the department maintains student clubs and organizations in which distance learners can take part. For those with academic ambitions, the Sigma Phi Omega honor society is also available. The University of Maryland University College is regionally accredited by the Middle States Commission on Higher Education. Northwestern State University of Louisiana ranks #8 on The 25 Best Online Bachelor's in Health Services Programs! Northwestern State University of Louisiana's online bachelor of science in health services administration is a degree completion plan marketed to healthcare administrative professionals already working in the field with an associate degree who want to advance their careers. To tackle the bachelor of applied science in allied health, applicants must possess an associate degree from an accredited allied health program -- or related discipline -- before applying. All applicants must also have earned a “C” or higher in all of the allied health-related classes to be accepted. Once students start at NSUL, they'll move through a 57-credit plan touching on cutting-edge topics within allied health and health services administration, including medical terminology, foundational healthcare, culture and ethics, and directed study. Two classes are specifically devoted to research, while another is focused on a team project. Distance learners meeting all the transfer credit requirements can typically complete their bachelor's degree in just three semesters: fall, spring, and summer. Those missing a few classes or required to take prerequisites may need an extra semester to graduate. Because this program was designed with the working learner in mind, all classes are available on a 24/7 basis and allow online students to log-in and watch lectures, respond to discussions with their colleagues, take exams, and turn in projects at times best suited to their unique schedules. They'll also never need to visit campus to complete degree requirements, but they are welcome to visit the Natchitoches campus for graduation if they want to walk across the stage and earn their diploma in person. Northwestern State University of Louisiana is regionally accredited by the Southern Association of Colleges and Schools. Davenport University ranks #9 on The 25 Best Online Bachelor's in Health Services Programs! Davenport University is a private college located in Grand Rapids, Mich. with a top-tier bachelor's of health services administration online that students nationwide can take advantage of. Comprising a full, 120-credit curriculum, the program is best suited to individuals without previous experience who are seeking entry-level leadership roles upon graduation. Davenport's program offers several concentrations for students looking to specialize their knowledge. Specializations currently available include human relations management, information technology, leadership and sustainability, and risk management. Depending on the path chosen, students must complete 12 to 15 credits to satisfy the requirements of their concentration. Coursework undertaken by every distance learner includes healthcare organizations and systems, principles of reimbursement management, and information technology for healthcare managers. Some of the advanced coursework taken in the junior and senior year includes healthcare strategic planning, healthcare risk management, and cultural issues in healthcare. In addition to time in the virtual classroom, all online students are also required to complete a 120-hour practicum at an approved healthcare facility to gain training in the field. According to a recent survey, 90% of graduates found employment within six months and 90% expressed satisfaction with their learning experience at Davenport. The program is fully certified by the Association of University Programs in Health Administration. The online portion of the program is overseen exclusively by an associate dean and department chair as well as two full-time teaching and learning coordinators. Davenport University is regionally accredited by the Higher Learning Commission - North Central Association of Colleges and Schools. Bay Path University ranks #10 on The 25 Best Online Bachelor's in Health Services Programs! Offered via The American Women's College of Bay Path University in Springfield, Mass., this bachelor's in health services administration online is unlike any others in this ranking. Designed specifically for female students aspiring to a managerial career in health services administration, the program provides a nuanced plan of study specifically tailored to building strong and skilled women leaders. First-time learners move through a sequence of general education classes before advancing into major-specific coursework. In addition to studying topics like policy and law in health services, healthcare marketing trends, and health services quality, students also can take Women Empowered as Leaders and Learners, a unique interdisciplinary course studying women leaders and their strengths. The capstone course, known as leadership in practice, calls on distance learners to demonstrate ways they've grown their knowledge and skills throughout the course and also helps them plan for employment after graduation. Classes at Bay Path are taught asynchronously by qualified faculty with experience in the classroom and healthcare services administration roles. Prospective students should know that all participants in this program are required to visit the Michigan campus once a week -- on Saturdays -- to take part in an integrative learning experience. Graduates have gone onto roles in large corporate hospitals, small community clinics, governmental health agencies, wellness centers, and emergency care facilities, among others. Bay Path University is regionally accredited by the New England Association of Schools and Colleges. Jefferson University ranks among The 25 Best Online Bachelor's in Health Services Programs! Philadelphia University and Thomas Jefferson University recently combined to become Jefferson, and its bachelor of health services online represents the best of both. Students can expect to graduate in two to three years with this accelerated degree offering. Eight-week courses allow students to move through two sequences of classwork each semester without sacrificing academic integrity. The degree requires 120 credits, including 24 hours of general education, 30 hours of lower division electives, 18 hours of general education, 21 hours of professional education, 12 hours of upper division electives, and 15 hours focused on the major concentration. Upon reaching that block of classes, learners tackle cutting-edge topics like public policy and planning in healthcare, the survey of health services delivery systems, and cross-cultural communication and diversity management. Alumni of the program have gone onto roles as hospital administrators, clinical directors, health information managers, and healthcare financial directors. Degree seekers need to submit a completed online application, official copies of their high school transcript, and a transcript showing any college-level classes completed before applying to Jefferson. The degree is highly focused on management and leadership skills and is perfectly suited to the distance learner seeking to function at a high level in healthcare administration. Students have multiple start date options each year, and all classes are available in an asynchronous format to allow for maximum learning flexibility. Jefferson is regionally accredited by the Middle States Association of Colleges and Schools. University of Louisiana at Lafayette ranks among The 25 Best Online Bachelor's in Health Services Programs! The University of Louisiana's Lafayette campus offers an online bachelor of science degree in health services administration for individuals ready to dive headfirst into the world of healthcare leadership. Created with existing healthcare professionals in mind, this program equips graduates with the advanced skills and knowledge needed to move into mid-level managerial roles and eventually to top-level leadership positions. Faculty members from health services administration, health information management, allied health, and health informatics all lead courses throughout the program to provide a holistic plan of study that addresses the unique needs of the industry. The program is designed to be completed on a full-time basis and typically takes four years. During the final semester of senior year, all HSA students complete a capstone seminar. In addition to providing an asynchronously-taught plan of study that is flexible time-wise, the program gives students three start date options: January, June, and August. Students straight from high school need to have at least a composite ACT score of 18 and a GPA of 2.0 or higher. Transfer students must provide transcripts from all colleges attended and have at least a 2.25 GPA. They should have already completed a 100-level English and a college algebra course before applying. The University of Louisville at Lafayette is regionally accredited by the Southern Association of Colleges and Schools. Northeastern University ranks among The 25 Best Online Bachelor's in Health Services Programs! From its main campus in Boston, Northeastern University provides an online bachelor of science in health management for students seeking a top-tier education but needing the flexibility of distance learning. This bachelor's degree in health and human services is an overarching plan of study covering healthcare management, finance, ethics, legal issues, policies and procedures, and regulatory issues. The all-around education at NU prepares students efficiently and effectively no matter which type of healthcare administration a graduate wishes to pursue. The curriculum is made up of 120 hours, including 21 hours of general foundation courses, 21 hours of health management foundation courses, 39 hours of required major courses, 12 hours of professional electives, and 27 credits to be used for non-business electives. In their final year of studies, all students enroll in a three-credit internship in healthcare management requiring them to find a suitable healthcare facility, hospital, agency, or other relevant site and complete 120-hours of onsite learning. In addition to giving hands-on skills and knowledge, this requirement also gives new graduates relevant work experience to add to their resumes. Interested applicants need to submit their high school/college transcripts, letters of recommendation, a personal statement, and if they have previous work experience, a resume. Because Northeastern is a private institution, all online students pay the same rate of tuition, regardless of their place of residence. Northeastern University is regionally accredited by the New England Association of Schools and Colleges. National University ranks among The 25 Best Online Bachelor's in Health Services Programs! The nonprofit National University offers a bachelor of science in allied health degree that gives students a holistic view of the healthcare sector, including the health effects of socioeconomic, environmental, behavioral, and biological factors. The program involves a total of 180 credits, 76.5 of which are at the upper-division level. These courses cover a range of subjects, including healthcare technology, informatics, health behaviors, and chronic and communicable diseases. In most cases, students can graduate in four years (or two years if they come into the program with an associate degree in a related discipline). National University also offers a course focused on electronic health records and the implementation of Meaningful Use criteria to provide the best possible care to patients. The course combines principles of healthcare delivery with the emerging technologies driving the medical field. This fully online bachelor of health services degree benefits those who have completed coursework at or graduated from a two-year community college. The program prepares students for healthcare-related fields, most notably those aligned with supervisory, managerial or educational roles. Many participants go on to pursue master's degrees. All National University distance learners access course materials via eCollege, the school's exclusive digital platform. Contact with instructors and classmates, the completion of assignments and exams, evaluations, and discussion boards all take place through this platform. The school is based in San Diego, California and has campuses across the United States. National University is regionally accreditation from the Western Association of Schools and Colleges. 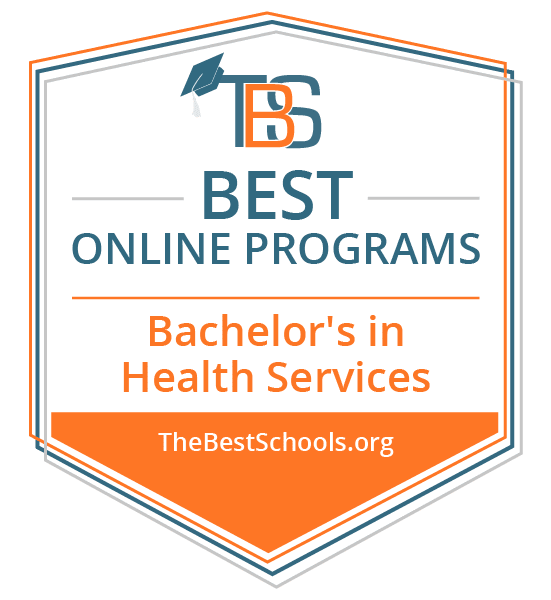 Belhaven University ranks among The 25 Best Online Bachelor's in Health Services Programs! Located in Jackson, Mississippi, Belhaven University offers a fully online bachelor of health administration degree that produces the next generation of healthcare administrators and leaders. Most courses are taught from a Christian perspective, allowing students to build on their faith as they learn the skills necessary for success in a dynamic and ever-growing profession. This online bachelor in health services administration program requires 124 total credits, with classes covering topics like healthcare quality management, healthcare marketing, economics, operational management, and business policy. The program may be completed entirely online. Belhaven also has affordable tuition that attendees pay based on each credit they take, and there is no difference in the rates paid by resident versus non-resident students. It is highly recommended that students fill out a FAFSA form before or shortly after they apply. In most cases, full-time students can complete all program requirements within four years. However, they may be able to reduce this time if they come into the program with prior credits from an accredited institution of higher learning. The school staffs admissions and transfer counselors to help students make the most of their previous college or university coursework. Belhaven University is regionally accreditation from the Southern Association of Colleges and Schools. Hodges University ranks among The 25 Best Online Bachelor's in Health Services Programs! At Hodges University in Naples, Florida, students have access to a bachelor of science in health services administration available either completely online or in an accelerated on-campus format. The goal of the program is to allow students to assume leadership and management roles in hospitals, clinics, and other healthcare organizations. As they work their way through the program, students take courses on the U.S. healthcare system, organizational theory, financial management, and strategic planning. The program, which is part of the School of Health Sciences, typically takes three years to complete, with students enrolling in an average of three classes (12 credits) each semester. Through the accelerated option, however, students take classes in 7 1/2-week half-terms, allowing them to complete up to double the classes in the same amount of time. To that end, the accelerated program usually takes a year and a half to two years to complete. Both Florida residents and those who live outside the state have access to the same tuition rate, which is based on how many credits a student takes each term. To enter Hodges University's bachelor of health services administration program, applicants must have an associate degree or have completed at least 60 credits of undergraduate coursework, maintaining a GPA of 2.5 or above. All students also must take an approved English composition course and six to eight credits of statistics or college-level math, while displaying knowledge of basic computer applications. Hodges University is regionally accreditation from the Southern Association of Colleges and the Schools Commission on Colleges. St. Petersburg College ranks among The 25 Best Online Bachelor's in Health Services Programs! Florida's St. Petersburg College offers a completely online bachelor of health services administration degree that features mostly eight-week class sessions. The only exception is a 15-week capstone experience where students integrate their career interests into their academic studies. When enrolling, students may choose from specializations in management, human services, compliance and security, public relations and marketing, and respiratory care. Regardless of the path selected, students gain skills and knowledge of healthcare delivery systems, healthcare policies, communication, strategic planning, and leadership. In all, students must complete 120 credits to graduate. This includes 25 credits of core classes and 15 credits of specialized courses. To enter the program, students must have already completed at least 60 credits of general education coursework—and many choose to do so through attending an accredited community college. In fact, some students enter the bachelor's in health services administration program already equipped with an associate degree in a related discipline. St. Petersburg College delivers nearly 700 distance education courses to more than 20,000 students per year through eCampus, its comprehensive online learning platform. Students taking these courses have access to variety of resources, such as academic advising, tutoring, technical assistance, a digital library, and help with financial aid. All exams are proctored remotely, enabling students to enroll in classes no matter where they live and work. St. Petersburg College is regionally accreditation from the Southern Association of Colleges and Schools Commission on Colleges. Robert Morris University - RMU Online ranks among The 25 Best Online Bachelor's in Health Services Programs! At Robert Morris University, students can pursue a bachelor of health services degree and take all of their classes online. The program gives professionals the skills they need to enter and advance within the healthcare administration field while focusing on improved patient care, lowering costs, and disease prevention. Through the program, students explore both theory and practical case studies as they learn about all aspects of the healthcare industry. Of the 120 total credits required, 60 must come from approved major-focused coursework. Another 21 credits come from open electives that support students' educational experience and help them build key skills as healthcare leaders. To graduate, students must maintain a GPA of 2.0 or above across all their courses. Robert Morris University offers a full slate of services to help ensure online students get the most out of their higher education journey. This includes access to student counselors who assist with enrollment, financial aid, and other issues, along with career advising services that help individuals develop a path to their professional goals. Wellness counseling, technical support, and a digital library are also available. When it comes to online students, there is no difference in tuition for Pennsylvania residents versus those who live outside the state. The school's main campus is located in Moon, Pennsylvania. Robert Morris University is regionally accreditation from the Higher Learning Commission. Weber State University ranks among The 25 Best Online Bachelor's in Health Services Programs! Through its bachelor of science in health services administration, Weber State University delivers an exceptional online program certified by the Association of University Programs in Health Administration, a global network of organizations dedicated to improving the healthcare industry. While students explore a wide range of subjects, the program emphasizes skill development in the areas of leadership, teamwork, interpersonal communication, organizational design, and decision making. Before entering the bachelor of health services program, students must receive a C grade or higher in several prerequisite courses, including those related to medical terminology, microeconomics, accounting, algebra, anatomy and physiology, and the healthcare system. Once enrolled, students take 44 credits of major-focused classes. While they may take these courses in an order of their choosing, the program does recommend a specific sequence to ensure students move through their course requirements as efficiently as possible. One notable class is legal and ethical aspects of health administration, which covers the many legal, regulatory, and ethical responsibilities of healthcare professionals and institutions. In the fourth and final semester, students engage in a practicum internship, through which they spend time in a healthcare leadership setting. They may learn from established professionals and witness firsthand the challenges that come with managing various types of healthcare organizations. The internship itself is worth six credits and must be approved by an academic advisor. Weber State University is regionally accreditation from the Northwest Commission on Colleges and Universities. University of Colorado Colorado Springs ranks among The 25 Best Online Bachelor's in Health Services Programs! The University of Colorado - Colorado Springs' bachelor's degree in healthcare science (allied health option) is part of the highly respected Helen and Arthur E. Johnson Beth-El College of Nursing and Health Sciences. The program has been designed for professionals who currently hold an associate degree or certificate in an allied health field wish to pursue a bachelor's degree to advance in their careers. Students may take classes at a pace that meets their needs and schedule, and all core courses are offered completely online at least once per year. There are also numerous elective classes available in digital formats. This online bachelor's degree in health and human services focuses on several key skills, including management, critical thinking, communication, and health promotion. While there are some on-campus class requirements, they are typically scheduled in a way that's convenient for both working professionals and more traditional learners. Each student works with an academic advisor to develop a program plan tailored to his or her career goals. To that end, the curriculum can be somewhat individualized to each student. UCCS has a friendly transfer policy and accepts credits from most accredited institutions of higher learning, including community colleges. To enter the program, applicants must have training in and be licensed, registered or certified in an allied health field. Incoming students must provide official transcripts proving they have finished at least 40 credits hours of training from an accredited program. The University of Colorado - Colorado Springs is regionally accreditation from the North Central Association of the Higher Learning Commission. Independence University ranks among The 25 Best Online Bachelor's in Health Services Programs! Independence University, located in Salt Lake City, Utah, offers a flexible online health services management bachelor's degree developed to allow students to move into their careers as quickly as possible. In fact, the program eliminates all unnecessary elective courses, and many students graduate within 20 to 38 months. Through this online bachelor of health services program, students explore key subjects like healthcare finance, economics, long-term care administration, marketing, medical technology, and health facility operations. This gives them the training and skills they need to eventually become hospital administrators, directors of healthcare departments, facility operations managers, or health services directors. Students must take a minimum of 180 credits, including a two-part practicum in alliance with professionals in healthcare administration. There is also a course called Healthcare Economics and Policy that examines the various financial and public policy issues healthcare leaders must navigate. Independence University charges the same tuition for both Utah residents and those who live outside the state. A large percentage of its student body receives grants and scholarships, with financial aid counselors available to guide individuals through their education funding options. Independence University is independently accredited through the Accrediting Commission of Career Schools and Colleges, which is recognized by the U.S. Department of Education. South Texas College ranks among The 25 Best Online Bachelor's in Health Services Programs! The South Texas College bachelor of applied technology degree in medical and health services management offers students valuable knowledge and skills related to healthcare systems, human resources issues in the medical field, healthcare reimbursement, electronic health records, and various policy and legal issues. Fully online, the bachelor of health services degree provides the flexibility and convenience that comes with distance learning. To apply to the program, prospective students must submit an online application, including their ACT or SAT scores. They also must complete an assessment exam before enrolling in classes. A student orientation and advising session are also required. To graduate, students must successfully complete a total of 120 credits, including 60 credits of major-focused classes and electives. Distance learners have access to many services at South Texas College, such as admissions help, registration, and career planning, with online connections to financial aid counselors, academic advisors, and tutoring. The school also assists military veterans and those who wish to transfer to or from another accredited institution of higher learning. While South Texas College offers relatively affordable tuition that students pay per credit hour, special low rates are available to those who live in Hidalgo or Starr counties. The college is located in McAllen, Texas. South Texas College is regionally accreditation from the Commission on Colleges of the Southern Association of Colleges and Schools. Upper Iowa University ranks among The 25 Best Online Bachelor's in Health Services Programs! Upper Iowa University's bachelor's in health services administration degree is a fully online program that is part of the university's business school. It provides a cohesive view of the U.S. healthcare system, focusing on issues like managing diverse populations, the effective use of business statistics, and navigating constant change in the healthcare industry. The program's curriculum covers management, marketing, ethics, accounting, managed care, and public and community health. The program includes 42 credit hours of major-focused coursework. One notable course is Health Program Planning and Evaluation, which examines the numerous concepts, theories, and issues impacting the delivery of healthcare services. Students learn about experimental and non-experimental study design, validity threats, and using sound methods of analysis. Additional courses focus on public health, healthcare legal issues, financial management, and managed care. There is also a three-credit internship required of all students. All Upper Iowa University University online classes are taught asynchronously, allowing students to complete course requirements on their own time. Each term is eight weeks long, with accelerated six-week summer classes available in some circumstances. Undergraduate distance learners at Upper Iowa University have access to the same tuition as those enrolled in more traditional on-campus programs. Online students also have access to services that include financial aid assistance, tutoring, a writing center, a digital library, and services for military veterans. The school's main campus is in Fayette, Iowa, with six other locations in Arizona, Illinois, Kansas, Louisiana, Oklahoma, and Wisconsin. Upper Iowa University is regionally accreditation from the Higher Learning Commission. Barry University ranks among The 25 Best Online Bachelor's in Health Services Programs! Barry University's bachelor of science in health services administration program offers the opportunity for those with healthcare experience to expand their skills and knowledge. The program starts with a course introducing the healthcare system, which establishes a foundation of key healthcare concepts. The final required course is a capstone that integrates what students have learned into a practical setting—typically at a hospital, clinic, or medical office. Also required is the submission of an experiential learning portfolio. This gives students an opportunity to translate their experience into as many as 30 college credits, which count toward graduation. Among the other required classes are those focused on group dynamics, the psychology of aging, public sector human resources, and healthcare law. Barry University's online platform enables students to complete their degrees at their own pace, while granting them access to career, academic advising, and personal counseling services. The school also assists with financial aid and helps students find the best ways to pay for their degree. The school is an active member of Quality Matters, an organization that maintains stringent standards for the delivery of online courses. The school's main campus is in Miami Shores, Florida. There is no difference in tuition for in-state versus out-of-state students. Barry University is regionally accreditation from the Southern Association of Colleges and Schools Commission on Colleges. New York City College of Technology ranks among The 25 Best Online Bachelor's in Health Services Programs! New York City College of Technology, the Northeast's largest four-year public college of technology, delivers a bachelor of health services administration degree that prepares individuals for many different entry-level managerial careers within the healthcare system. The program is designed as a next step for those who already possess a healthcare-related associate degree and have some professional experience. Many of the program's incoming students serve in positions like dental hygienists, nurses, vision care assistants, and respiratory therapists. Because of this, the program features classes scheduled around the lives of working professionals, with many evening and weekend options. Students access lectures, interact with instructors, engage in class discussions, and complete assignments through the BlackBoard online platform. They are encouraged to master the art of self-directed learning and develop their skills based on the careers they would like to pursue after graduation. To qualify for admission, prospective students must have an associate degree with a GPA of at least 2.5. They also must have certification or licensure in a clinical health science field or at least two years of full-time employment experience in a healthcare setting. Before starting their coursework, each student meets with an academic advisor to review all transcripts and outline a path to graduation. In all, this program involves students taking 120 credits, with the average full-time student graduating within two years. The college is part of the City University of New York system. CityTech is regionally accreditation from the Middle States Commission on Higher Education. Earning your online bachelor of health services degree prepares you to enter a range of careers, including community service management, medical records technicians, and administrative management. The responsibilities of these roles require attention to detail, strong organizational capabilities, and leadership skills. Social and Community Service Manager: This professional oversees programs that deliver social services to community residents, including coordinating and leading all administrative logistics of programming to ensure quality. Managers must also track and monitor all programming, revising initiatives as necessary for improvement. In addition, some social and community service managers draft proposals and solicit donations for funding to underwrite programs and salaries. An advanced degree can further build your written and oral communication skills, which are invaluable to fundraising. Medical Records and Health Information Technician: This expert manages health information data to ensure the information is complete, accurate, accessible, and secure. Data includes patients' medical history, both in print and electronic formats. Understanding and adhering to classification systems within specialty software allows technicians to code and categorize patient records. Earning a graduate degree in health services can increase your technology capabilities. Administrative Services Manager: These professionals coordinate and lead support services for organizations to ensure function. Services can include office logistics, mail delivery, filing, and bookkeeping. The role necessitates supervision of clerical and administrative staff, establishment and revision of office policies and operations guides as necessary, and facility oversight for safety and upkeep purposes. You might decide to earn an advanced degree in health services to further hone your leadership abilities and advance within the field.